The gf didn't have anything to do today so she came with me to the guitar shop again in Shinjuku. Thankfully today it was actually open. I saw the guitar I was after right at the counter. 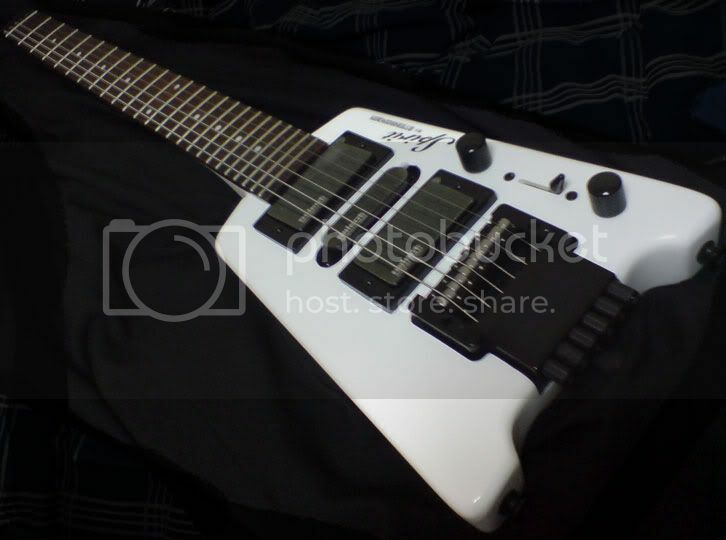 There was a black Steinberger Spirit GT-Pro standard for 55,100 yen and a white deluxe version for 63,000 yen. I tried both but prefered the white one. For the colour and also the humbucker at the neck sounded better than the single coil of the black one. I managed to talk him down to 60,000 yen (about AU $565). This is a reasonable price and it included a bag and string adapter. The sales guy didn't speak much english but Yuko helped as usual. I paid with my australian credit card. I haven't checked if my pay from work has gone through. At least I'll have quite a few interest free days to pay off the largest purchase I have made so far after my rent. I didn't have much time when I arrived back at Tomioka. I webchat to my mother and showed her my new guitar. I already have about six guitars in Australia. I was surprised by her reaction. I expected worse. All she said was "Couldn't you wait until Christmas?" Hmm. At least I have a guitar that I take with me anywhere on planes. I arrived at Yokohama close to punch-in. I've been leaving later and later, not leaving much time if I make a mistake or to rest. Again, it was another quiet day. I only had a ability test to do. I didn't do any classes. After a day off it was just what I needed. Don Quixote, What Do You Say? Harajuku, Meiji-Jingu & Krispy Kreme, Shinjuku!